Is one of the best fruits available. Guava's are cholesterol, saturated and sodium free, plus low in fat and calories. Guavas are high in fiber. Some studies find a lower risk of cancer among people who eat more fruits and vegetables rich in dietary fiber, carotenoids and vitamin C.
The edible rind of a guava contains 5 times more vitamin C than an orange. Guavas like other tropical fruits should not be refrigerated unless over ripe. The seeds of a guava can be eaten and the taste is often described as a cross between pears and strawberries. Others find a lower risk among people who eat more of any fruits or vegetables. But fruit aficionados may want to pick the most nutritious of the bunch. Guava is a great fruit because it contains key nutrients like: vitamin C, carotenoids, folate, potassium, fiber, calcium and iron. Calcium is typically not found in high amounts in many fruits. Diets low in saturated fat and cholesterol and rich in fruits and vegetables that contain certain types of dietary fiber may reduce the risk of coronary heart disease. 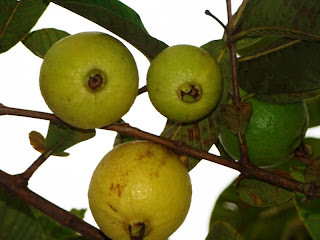 Good quality guavas should be firm and free of bruises. Ripe guavas should exhibit a fragrant fruity aroma. They will continue to ripen after harvest and should be stored at room temperature unless it is very ripe it should be refrigerated.